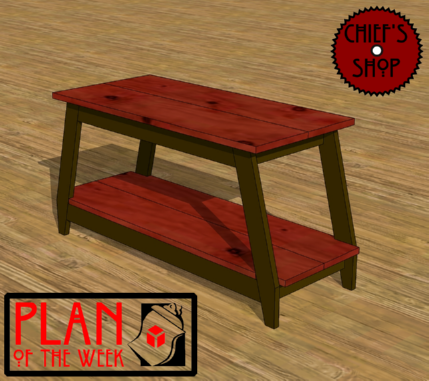 The Chief’s Shop TV Stand works for a large TV and components, but could also be used as a low hall table. It may look complicated with all the angle cuts, but they are all consistent (15 degrees) and easy to cut on a miter saw. The overall dimensions are 41 1/2 x 16 1/2 x 20 1/4. You’ll need a table saw, miter saw, jigsaw, drill driver, and Kreg Jig to build it. Lumber required includes a 1x10, 1x8, and three 1x3s.